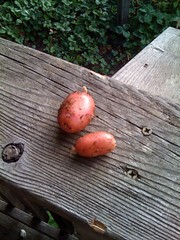 These are the first potatoes I have ever grown. Such cute little guys. They are French Fingerlings- pink inside and out. Basically they are recycled potatoes I got from the co-op that had started growing in the dark cupboard inside their plastic bag. So, I planted them. Highly recommend it. Barely any effort and now I hopefully have a whole new bag o' taters! I can't wait to harvest the rest!